We live in a time of wonders and miracles, and one of them is taking shape in San Francisco Bay. 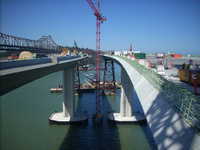 The new eastern span of the San Francisco-Oakland Bay Bridge will replace the cantilevered span built in 1936. The old span was vulnerable to earthquakes -- as the Bay Area discovered in 1989 -- so the new structure is designed to be a bit less fragile. Happily, we also live in an age when the tools of digital photography are more accessible than ever before, which means we're no longer dependent upon "official" photographers to deliver images of our modern wonders as they take shape. I'm a union electrician (Local 6 San Francisco). I'm the guy on the job who will climb anything, anywhere, so I usually get really good jobs. A lot of guys are afraid to climb tower cranes and hang off walls, but I have no fears as of yet (except roaches). I started taking pictures at work mostly for the workers, so they could show people what they do. I was approached by one of the companies on a job, and they asked to buy my work -- I had no idea! Later I was working on the San Francisco Center (835 Market St.) and the general foreman said I was wasting my time being an electrician, and that I should take photos. I now use my connections to gain access, and I try to work on the bigger projects in town. I've befriended many of the ironworkers who can help me get the vantages I need to shoot the photos I like to take. So how's the view from the cranes working on the bridge? 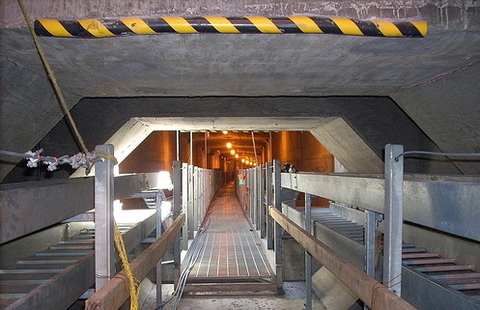 What does it look like inside the new bridge's crawlspaces and passageways? What do we look like as we drive past on the old part of the bridge? SF Emperor captured all the angles so the rest of us can enjoy the scenery.